Israel preparing to knock out Syrian missiles? Speaking at Israel's Institute for National Security Studies, Maj.-Gen. Eyal Ben-Reuven, who served as deputy commander of Israel's northern forces during last summer's war in Lebanon, said that the army is “preparing itself for an all-out war, and this is a major change in the military's working premise” following the 34-day conflict with Hizballah that many Israelis feel their nation failed to win. The general said that when war breaks out, Syria will be prepared to suffer mass military and civilian casualties, while at the same time playing on Israel's sensitivity to civilian losses by striking Israel's home front with as many missiles as possible. Syria “will try to hit Israel's home front in order to win diplomatic gains in peace talks that will follow, and also cause another split in Israeli society,” Israel National News quoted Ben-Reuven as saying. Does Israel remember how to conduct a six-day war? Why would it announce it in advance? Doesn't that take away the element of surprise? Israel, Syria agree on peace terms? 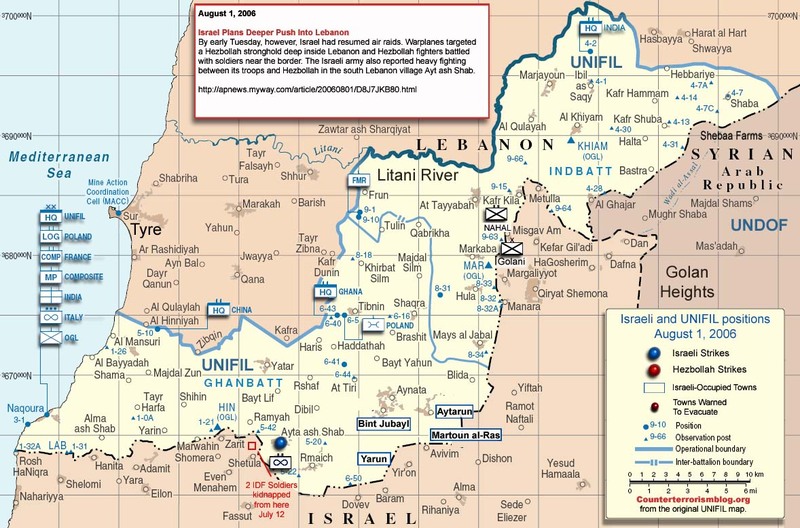 In a series of secret meetings in Europe between September 2004 and July 2006, Syrians and Israelis formulated understandings for a peace agreement between Israel and Syria. Minor problem: all sides deny and say the story is false: the Syrians, the current Israeli government, and former Prime Minister Sharon’s bureau chief. Denying anything about secret negotiations is SOP, so we just don't know. "It was the hugely ambitious project of the Bush administration to transform the entire Middle East by remaking Iraq into an irresistible model of prosperous democracy. Having failed in that worthy purpose, another, more prosaic result has inadvertently been achieved: divide and rule, the classic formula for imperial power on the cheap. The ancient antipathy between Sunni and Shiite has become a dynamic conflict, not just within Iraq but across the Middle East, and key protagonists on each side seek the support of American power. Once the Bush administration realizes what it has wrought, it will cease to scramble for more troops that can be sent to Iraq, because it has become pointless to patrol and outpost a civil war, while a mere quarter or less of the troops already there are quite enough to control the outcome. And that is just the start of what can now be achieved across the region with very little force, and some competent diplomacy. The Iraq war has indeed brought into existence a New Middle East, in which Arab Sunnis can no longer gleefully disregard American interests because they need help against the looming threat of Shiite supremacy, while in Iraq at the core of the Arab world, the Shia are allied with the U.S. What past imperial statesmen strove to achieve with much cunning and cynicism, the Bush administration has brought about accidentally. But the result is exactly the same." Very interesting, and worth the read. Perhaps we are winnng, after all. Don't know if this is the right way to look at it, but any analysis which puts things in a good light is refreshing. Military planners develop plans. Lots of them. The fact that Israel has such a plan does not mean it would ever use it. Unfortunately, Iran will probably use this to justify its need for nuclear weapons. "President Carter's book on the Middle East, a title too inflammatory to even print, is not based on unvarnished analyses; it is replete with factual errors, copied materials not cited, superficialities, glaring omissions, and simply invented segments." Underneath that benevolent and unbiased demeanor "Jimma" projects is an biased agenda. Strike before Iran gets air defenses? The timetable for a strike [by Israel] may not depend upon when Iran may become nuclear capable. Instead, a strike may end up being based on when Iran is able to protect their nuclear facilities. Currently, Iranian Air Defenses are not capable of defending against a well-trained air force. But the Iranians are importing new air defense weapons, and have been in talks for years with the Russians in an effort to build a new command-and-control system for their air defense forces. Should they start showing any real progress towards a functioning, well-coordinated air defense, the Israelis may decide to go ahead with an attack no matter how close they are to making a nuke. Interesting, and still plausible, even though it's almost a year old. Thanks for linking it to the hitching post, Woody. With Iran within a year or two of having an operational 400-mile IRBM (see earlier A-C-E post), Israel may be approaching the point where it feels compelled to pre-emptively strike. Iran threatens to give US "pain"
Iran threatened the United States with "harm and pain" Wednesday if the U.S. tries to use the U.N. Security Council - which has the power to impose sanctions - as a lever to punish Tehran for its suspect nuclear program. Washington warned that Tehran has enough nuclear material for up to 10 atomic bombs. If they are threatening us now, just imagine what they might say if and when they have the bomb and a delivery system. "I think if the president had not started the process of getting reform in people's minds, we would have been much more complacent. But because there was outside pressure, people had to look in the mirror and think of how to move forward." "What have the Americans ever done for us?" Woody's blog is now linked under FEATURED BLOGS (where I put new blogs of interest) in the left sidebar, as recommend reading. The Hitching Post (first A-C-E post every AM) is a great way to find like-minded blogs. Just wish more blogsters would avail themselves of it. It's only a few days old, so maybe they will in time. The Cranky Neocon was cheered up this AM by a NY Times article entitled "For Bush, No Boasts, but a Taste of Vindication" (registration req'd). Nobody wants to get caught way out in left field when the game winning ball is hit deep into right field, so even the left-leaning MSM is printing these "what if" and "maybe" articles, just in case they were wrong. They are springing up like daffodils in the South.